tips & tricks for Saltwater Multispecie fishing. Popular locations include fishing piers, around jetties, bridges, manmade structures, areas with a rip tide, and shorelines area during high tide phases. High tide is an excellent time to catch fish as food is washed into the shoreline areas. Excellent action often takes place immediately before or after heavy storms. Dawn and dusk are also excellent. Live bait rigs will catch a large variety of fish. Popular cutbaits include squid, mullet, bunker, shrimp and clams. Thread chunks onto rigs and cast beyond the incoming surf. When casting, rigged swirltail grubs and rigged shad are very effective. Manmade structures attract fish. Fish are attracted to the cover and baitfish activity that bridge pilings, long pier supports, and other structures provide. Fish as close to the structures as you can. Signs of actively feeding fish include large groups of circling, diving birds, jumping baitfish, and boils created by surface feeding fish. Cast into this activity when seen. Here are some popular approaches to fishing multiple species in saltwater. This is excellent for fishing live or cut bait. The bait is suspended off the bottom while the sinker maintains the rig’s position. Use a pyramid sinker for sandy bottoms or the bank sinker on harder, rockier bottoms. Attach hook to the snap. Attach the sinker to the bottom snap. Place a 1-in to 3-in chunk of cut bait (squid, fish, or clam) on hook. This is an effective rig for multiple bait presentations. It is good for stillfishing from piers, shorelines, and other saltwater areas. Place a 1" – 3" chunk of cut bait on hooks. This rig is great for drifting or still- fishing. It allows the bait to move naturally and is good for finicky fish as it provides little weight or resistance as the fish picks up the bait. Tie 2' – 3' length of leader to the other end of swivel. Tie hook onto end of leader. Place live bait or cut bait on hook. Spoons are very effective lures. Their wobble and reflective qualities make them highly attractive to fish. The slow retrieve is for cooler water and when the fish are near the bottom. Make your cast, let it sink to the bottom. Retrieve it slowly, allowing the lure to swim and wobble. 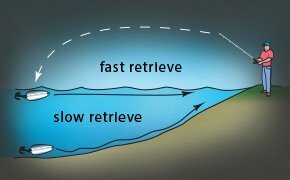 Use the fast retrieve when fish are feeding near the surface. Retrieve the lure at a faster speed that simulates fleeing prey.